Q: Within four months of passing my driving test I was caught speeding at 46mph in a 40mph zone. To my amazement I’ve recently noticed this same road on which I was caught, now has a 50mph speed limit. Surely I’m able to appeal against my previous conviction and have the three points overturned? A: It depends whether or not the speed limit was 50 at the time you committed the offence. If it was a 40 limit at the time, you can’t appeal. Also you can’t appeal if you accepted the fixed penalty offer. You can only normally appeal against conviction if you pleaded not guilty and you were convicted. Q: I was driving to pick up my friend, when the car behind me started to drive very close to me. It kept speeding up and slowing down, generally driving like an idiot. I tried to slow down to just under the limit to get him to back off but he wouldn’t. I was getting annoyed so I slammed on my brakes. He slammed on as well and it worked because he then backed off. However, a police car was stationary in a side road and the policemen inside stopped both vehicles. They have given me an s59 warning. I don’t think this is fair because it was the other driver’s fault. A: In these circumstances, an s59 warning means that if another offence of driving in a careless or inconsiderate manner is committed in the next 12 months by the driver of the vehicle or the vehicle with the warning issued to it, the police have the power to seize the vehicle. Whilst it may seem unfair, and the other driver should certainly be held accountable as well, your actions amount to driving in a careless or inconsiderate manner. Slamming on your brakes could cause an accident, so is viewed very seriously by the police. You have been lucky to have only been given a warning on this occasion, and not prosecuted. Q: I have recently received Notices of Intended Prosecution (NIPs), for two minor speeding offences. They occurred on the same road within a week of each other. I accept I was slightly over the limit on both of them but honestly had no idea I had committed even one offence, until the NIPs came through. I have a clean licence but am really worried that, as a result of one stupid week, I am going to have to sit my test again. I passed my test but then got caught with no insurance; I was given six points and had my licence revoked so I had to sit my test again. I’m really worried that these points mean I’ll have to do my test a third time. A: If you were revoked as a new driver and sat your test again, you are no longer subject to the new driver provisions. This means you don’t have to sit your test again and you can accrue up to 12 points before being at risk of a minimum six-month ban. It is likely that the police will offer you a speed awareness course for one of the offences, providing you haven’t already done one in the last 3 years. That will get rid of 3 potential points. You can then accept 3 points for the second offence, taking you to 9. You will just need to be careful in the future to make sure nothing else happens whilst the current points are still active. Q: I was driving to my friend’s house a week ago and my vehicle clipped the kerb. I didn’t think anything of it at the time as it was a really minor incident and I hadn’t hit anything, but further down the road, the police stopped me and told me my tyre was defective. They gave me a fixed penalty for driving with a defective tyre. I have three points already but don’t want to have to sit my test again as a new driver. What do I do, as I genuinely didn’t know the tyre was defective? The officer gave me a fixed penalty. A: Did clipping the kerb cause the defect with the tyre? If so, you have a potential S48 argument. This means that if you can show you had no reasonable cause to believe the tyre was defective then the court won’t impose any points against you. You will however need to take the matter to court to put this argument forward. If the defect was because you clipped the kerb, you would have a strong case to show it was reasonable for you not to know about the defect prior to driving. The burden will be on you to show on the balance of probabilities you didn’t know. If the argument doesn’t succeed, the only way to avoid sitting your test again is to avoid the points. You would need to ask the court to impose a short ban instead of the points. It’s not an easy argument as the court ’s starting point is always to impose the sentence for the offence, but it’s certainly possible if you can show the consequences revocation would have on you. If you don’t want to be revoked, don’t accept the fixed penalty. If you do, the DVLA will write to you and the revocation will be automatic. There is no discretion over this. You have to request a court hearing to have any chance to avoid the points. Q: I’m being prosecuted for driving without due care and attention. I was coming over the brow of a hill, and just over the other side, the road swept sharply to the right. As I drove over the brow, I saw a car in the opposite direction driving slightly over to my side. It was all a blur, as it was a national speed limit, so we were both driving quite fast. I can’t remember where I was positioned in my lane. The next thing I knew, the cars had collided. They were both a write-off, but thankfully any injuries to myself and the other driver were minor. I’m really worried about having to attend court. A: The first step is to look through the evidence and see if there are any grounds to challenge it. To convict you, the prosecution have to show beyond reasonable doubt that the standard of your driving fell below that of a careful and competent driver. 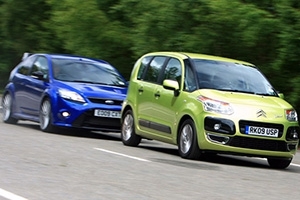 If the accident was as a result of the other vehicle’s positioning on the road then you would have a defence. However, as you can’t remember the incident clearly, it makes it difficult to defend. If there’s no defence, a good alternative would be to see if the Crown Prosecution Service will allow you to complete a Driver Improvement Course. This means any proceedings will be withdrawn and you will not have to attend court. You will also be entitled to reclaim your reasonable legal expenses, if you have paid us to assist you. We have an 83% success rate at persuading the CPS to withdraw cases such as yours. If unsuccessful, you will be at risk of 3-9 points. If the court considers it serious, it could impose a discretionary ban instead of points. We will liaise with the court to see if they are willing to sentence you in absence to avoid you having to attend. If they agree, we will deal with sentencing on your behalf and push the court for the lowest possible penalty. If they do not agree, you will be represented in court by a barrister. Q: I have received a NIP (Notice of Intended Prosecution) for driving without due care, failing to stop and failing to report an accident. I was parking on the street at around 10:30am, and while doing so I clipped a parked car in front of me. I got out and checked and didn’t see any significant damage; there was certainly no damage to my car but I panicked and drove off. I drove home to speak to my parents. I have only been driving for six months and didn’t know what I should do. They told me that I didn’t need to do anything and not to worry about it. The other issue is that the time on the Notice is 17:30. A: If you recall being in that place in that vehicle, it’s likely that the time on the Notice is a typing error. The time needs to be confirmed with the police. If it does relate to when you parked at 10.30am, you need to confirm you were the driver by completing the Notice. You need to get to the bottom of what the police are suggesting has happened. It’s likely to relate to the incident you mentioned, but to prosecute you for failing to stop and failing to report, the police will have to show damage was caused to the other vehicle. If there was no damage, you weren’t under a duty to stop or report it. If it can be shown that damage was caused and you knew about it, you wouldn’t have a defence for failing to stop because you were under a duty to stop and remain at the scene for a reasonable amount of time to enable someone to request your details as necessary. You accept you simply drove off. In relation to failing to report, you wouldn’t have a defence but you would have a Special Reasons argument on the basis you were misled by your parents. As an inexperienced driver, it would be reasonable for you to rely on advice from your parents. If Special Reasons are found, no points will be imposed for that offence. With regard to driving without due care and attention, the police will have to show that the standard of your driving fell below that of a careful and competent driver. This again will depend on the evidence and what they are saying you have done. If a “careful and competent driver” in the same circumstances had caused the same damage then you would have a defence. The best course of action would be to liaise with the police and persuade them to allow this matter to be resolved through insurance companies. Incidents like this are the whole purpose of insurance. If the police are still considering taking it further, we will see if they will allow you to complete a Driver Improvement Course. This is an alternative to prosecution and will mean no further action is taken. It is certainly something we can help you with and have 96% success rate at persuading the police not to take any action. You need to handle the process carefully because if it is taken to Court, you risk 5-10 points. As a new driver, if you receive six points or more during your probationary period you will have your licence revoked. Q: I was stopped for drink driving and taken to a police station. Whilst there I responded "no comment" when questioned, so the breath test procedure was abandoned and I was charged with failing to supply a specimen – which carries a ban and hefty fine. I’ve pleaded not guilty but what can I now expect? A: The important question is what you were being asked at the time you responded by saying "no comment". If you were asked to confirm your willingness to give a sample, the issue is whether saying "no comment" amounted to a refusal - you may be able to argue that they should have passed you the tube to see if you would blow? If they were asking you general questions in relation to your health I don't think they can argue that saying "no comment" amounted to a refusal. It sounds like the police got annoyed very quickly and felt that you were being obstructive. A refusal or failure can be inferred from your conduct and a failure to respond can amount to a refusal. Q: I’ve received a notice of intended prosecution for speeding whilst driving a car I'd never heard of. The notice was sent to me at my old address but auto-forwarded by the Post Office. I suspect I'm the victim of an identity theft. The police won’t reveal who gave my name and address or confirm that I'm not the registered keeper. A: If you’re not the keeper of that car and have no knowledge of it then you need to respond by telling the police this. Be careful because you could get a summons for failing to provide driver details - which carries six points and would lead to a ban if you’’ve been driving less than two years. Check with the DVLA that someone has not registered you as the keeper of the car. Q: I got pulled over by the police, who noticed that I had a tint in my front passenger window. They say it’s illegal but I’ve had the car for three years, I’ve taken it to three different MoT test centres in that time and I’ve never been stoped by the police before. I got a fixed penalty notice which meant a £100 fine and three points on my licence. Can I appeal this? A: Your only chance would be to take the matter to court and argue special reasons on the basis that you did not realise that the tint was illegal, or persuade the court that you were unaware of the issue and the risks. You may be able to avoid the points. Based on what you’ve said you have a decent chance of avoiding the three points but you’ll need help from a lawyer if you want to stand a realistic chance. These are complicated legal issues. With ever more cameras on our streets there’s a good chance you’ll get caught out if you choose to disobey our mass of driving laws; get nicked and you can kiss your clean licence goodbye – pushing up your insurance premium in the process. These are some of the key ways you can come unstuck while behind the wheel; most offences carry points rather than a disqualification, but notch up 12 points or more (six points if you’ve had your licence less than two years) over a three-year period, and you’ll be banned. Obeying traffic lights isn’t optional; go through one on red and you’re guaranteed three points and a £100 fine. Get snapped driving above the speed limit and that’s three points on your licence plus a 100 quid fine. Contest it when you’re in the wrong and you’ll get up to six points and possibly a £1000 fine; go crazy on the motorway and you could be fined £2500 and suffer an unlimited ban. This is the same offence as if you fail to take notice of a traffic light that’s on red – which means you get three points and a fine of up to £1000. Those yellow lines are there for a reason; you’re not allowed to stop on them, only pass through. The level of fine is set by the local authority, but it’s normal to be stung for 80 quid if you get it wrong. Even if it’s a broken white line you’re crossing, overtake when it’s unsafe and you’ll probably be done for driving without due care and attention. That means you’re liable to a fine of up to £2500 and you’ll get 3-9 points on your licence – or you could be banned altogether. Do you really need to get there a few seconds earlier? If your tyres are flat, bald or damaged in any way, you can be served with a £2500 fine and three points – for each tyre. So if each corner is duff, that’s your licence gone. Check you have 1.6mm of tread all the way round the tyre, and across at least three-quarters of the width to stay legal. It’s still legal to use your mobile if you’ve got a bluetooth hands-free kit, even if it’s not to be recommended. However, get caught using it hand-held and you can look forward to three points on your licence plus a 100 quid fine. Crash while texting or making a call and you’ll probably go to jail if you kill someone – it really isn’t worth the risk. This can be anything from eating, smoking or drinking to shaving, reading or using a laptop while driving. Do any of these things and you could be fined three points and fined £100 – especially if you crash as a result of your actions. Get nicked while you’re over the limit or under the influence of drugs, and your licence is history, end of story. You can kiss it goodbye for a year, and if it’s your second offence within ten years you’re on the bus for the next three years. It doesn’t end there though; you can also be jailed for up to six months and be fined up to five grand. If you crunch your car causing personal injury to someone, you have to stop and give your details, then report the incident at a police station. Fail to do these things and you could be banned from driving. Either way you’ll get 5-10 points plus a fine of up to five grand. Your car has to be insured if you use it on the public road. Drive uninsured and you’ll get stung for up to £5000, you’ll get 6-8 points on your licence, you could be banned indefinitely and you might have to sit a retest. Ouch! Now here’s one that doesn’t make sense; get caught driving without a valid licence and you’ll get 3-6 points awarded – but on what? You haven’t got a licence for them to endorse! However, you can also be fined up to a grand, and if you’re caught driving while disqualified you can be put in the slammer for six months, fined £5000 and banned indefinitely. Everyone’s an expert when it comes to the law, especially where parking is concerned. But don’t listen to people whose received wisdom comes from the pub or dodgy websites that know nothing. If you want to know where you stand with parking, check out our guide to parking laws, read this page too – and don’t forget to check out FirstCar’s legal section too. Many assume that bank holidays mean free access to resident's bays and streets with yellow lines. While some councils have set this precedent and it’s often assumed that traffic wardens don’t work on bank holidays, in reality, many councils enforce bank holiday parking. Private car park owners can’t issue fines, although any document they give will often be dressed up and worded in such a way that it looks like an official fine. Private car park owners can only issue you with an invoice, essentially for breach of contract. This doesn't mean that private car park owners can't charge you for parking on their land, or attempt to reclaim money if you fail to pay. It does mean, however, that they can’t legitimately demand money and expect payment through the issuing of the notice alone: contract law means they have to take you to court first. In practice, private car park owners often fail to bring matters to court, and even when they do, their 'contracts' are often unenforceable. Apparently, many drivers who challenge such tickets, end up not having to cough up – but you can’t rely on this. It became illegal to clamp, tow or block in vehicles on private land in October 2012. So if your car is clamped in such circumstances, you have the right to call the police. Some motorists assume that yellow line restrictions are the same everywhere. For instance, they may believe that it's legal to park on a single yellow after 6pm - a common time for councils to remove the restriction. However, the rules vary and you should always check the accompanying sign - there are plenty of roads that restrict parking later or earlier than roads you may be familiar with. Though single or double yellow lines can be parked on with a Blue Badge, the maximum time is three hours. Many double yellows exist for safety: it wouldn't be advisable or desirable to park on double yellows at a junction, and only in extreme cases would such a manoeuvre be legally permissible. If a single or double yellow line specifically restricts loading and unloading, Blue Badge holders can’t park there. In certain areas, Blue Badge holder parking bays have time restrictions. On private land, Blue Badge holders enjoy no special permissions unless signage indicates otherwise. Central London (including parts or all of Westminster, Kensington, Chelsea, Camden and the City of London) has its own, tighter parking concession rules. Even when obeying all of the above restrictions, a Blue Badge holder must move their car if requested to by a traffic warden or police officer. Parking enforcement is sometimes said to have a 'three-minute amnesty' on ticket expiry, the idea being that a warden's watch could easily be a few minutes out. * This article was brought to you in association with Nationwide Vehicle Contracts. Millions of parking tickets are issued by traffic wardens around the country, every year, raking in hundreds of millions of pounds. Many of these tickets are issued to drivers who think they should be the exception to the rule – while many are oblivious to the rules. In some cases, wardens issue tickets that they really shouldn’t, so just because you get a parking ticket, don’t assume that you have to cough up – you can appeal against it, as you can read in our guide – also check out our guide to parking myths. It doesn’t help that in the UK there's a bewildering range of signage that dictates where we can and can’t park. Here’s how to work out whether or not you’re safe. Restricted parking during certain times of day: check the accompanying sign. In addition to parking restriction, loading isn't permitted. In addition to any parking restrictions, loading isn't permitted between times indicated by sign. No parking at any time, except to drop off passengers. No parking, loading or boarding at any time. No parking, loading or boarding during times indicated by sign. No parking in the clearway zone between the times indicated. No parking during period of operation. No parking without a valid Blue Badge. No parking at any time (though the illegality of any of these may depend on the local authority). Assume that it’s not legal to park. Parking on the pavement – even if you’ve got just two wheels on there – contravenes the Highway Code. Section 244 specifically prohibits pavement parking in London, but essentially suggests a blanket ban 'unless signs permit it'. Enforcement of this section of the code varies from council to council; the Highway Code is a guide rather than a road traffic law reference. So use your common sense and be considerate; parking on pavements in areas with high pedestrian traffic is especially problematic as you're then forcing pedestrians onto busy roads. Similar to the above, the Highway Code describes parking in front of a dropped kerb used for a driveway as a violation. Legally, the Highway Code doesn't necessarily carry any weight, but under The Road Vehicles (Construction and Use) Regulations 1986, section 103, you may be towed or fined for causing an obstruction. In the UK, the Blue Badge scheme allows people with severe walking disabilities, the registered blind and those with severe upper body disabilities, to park more freely through usually restricted zones. Because the Blue Badge applies to the holder rather than their vehicle, the badge must be displayed at all times, but it can’t be used by carers if the holder isn’t present. To make cash from urban car owners, many local authorities have created controlled parking zones (CPZs), which force residents, visitors and local businesses to apply for permits. These permits allow parking in bays within the applicable zone; anyone who hasn’t coughed up for a pass will be fined if they’re caught out. Q: I recently received a summons for parking in a pedestrian crossing zig zag line zone. It was the only place I could pull up without obstructing private car parks, junctions, an exit from a roundabout and people's private property. I left my friend in the van with the engine running. I was gone for just a minute or two then returned to find a very irate policeman had moved my van. Is he allowed to do this or is it taking without consent and will this aid my case if I mention it? He was shouting at people driving past and then shouted at me when I asked him for help. He has a responsibility to the community to help but he refused. He parked up obstructing the entrance to a private car park on double yellow lines. A: This is a strict liability offence, so there is no defence if you accept you stopped on the zig zags. The police take these matters very seriously as it causes a major safety risk for pedestrians. The court will have little sympathy for your difficulties in parking. The court won't be more lenient because you found it difficult to park elsewhere or because the officer was really angry with you. Don't make reference to the officer stopping on a double yellow. He only did that to get you to move off the zig zags and it will just irritate the court. Q: I was due to sit my test on the Monday morning. I was really nervous about it, so on the Sunday night, I decided to go out and practise driving on my own. I know I shouldn’t have, but I just wasn’t thinking at the time. I was stopped by the police and they’ve said I will be prosecuted for driving without insurance and driving otherwise than in accordance with a licence. I’m really worried as I’ve now passed my test and am going to have to do it again when I get points for this. A: Driving without insurance carries between 6-8 points and without a licence another 3-6, but the court is unlikely to impose two sets of points; I’d expect you to get eight points in total. You’re not going to have to sit your test again, as the offence happened before you passed your test. The points will sit on your licence and it’s only if another offence happens now, whilst you’re in your two-year probationary period, that you’ll be at risk of revocation. Q: In 10 days’ time I’ll have held my licence for two years, but three months ago I was given three points for speeding on the motorway. Then, a few days ago, I was driving towards a junction with my cousin sat next to me when she had a panic attack. As a result I drove through a red light by mistake. As a result I was given another three points, taking me to six. I went to the police station and spoke to somebody who said that if I was given three points on a motorway and three points crossing a red light, my licence would not be revoked until I’d notched up nine points within the first two years. I have a certificate from my cousin’s doctor to say that she does suffer from panic attacks. A: You’ve been misadvised. If you get six points on your licence and the most recent offence is during your probationary period you will have your licence revoked. You’ll then have to take an extended driving test before you can drive again. Your only option would be to go to court and make a special reasons argument regarding the panic attack being a distraction. If the court agrees you won't get the points and you’ll keep your licence. Q: I received a summons for driving at 41mph on a 30mph road, but the summons arrived a month after the alleged offence, the document being dated only yesterday. I think the reason for the delay is that the DVLA thought I’d sold the car when in fact I had sold a car that used to carry the same personalised registration. My understanding is that a summons has to be delivered within 14 days of the offence taking place; is this the case? A: The only burden on the police is to send the summons to the last known address of the registered keeper. A police mistake can amount to a defence. If the mistake was on the part of the DVLA, you can’t argue that the summons was delivered late, if the police simply sent it within 14 days to the (incorrect) name and address on the V5. Q: I was driving on a single-carriageway road with a tractor and van ahead. The van overtook the tractor and so did I, but when the van pulled back in he left me no room, so I had to get past him too. On the opposite side of the road was a police bike; as soon as I noticed him I reduced my speed. He pulled me over saying he’d caught me doing 60mph in a 40mph zone. I didn’t argue at the time but he didn’t show any proof and I just took his word for it. I was given a fixed penalty notice with three points but I think I’d like to take this to court as the van also overtook and to stay safe I had to get back into my lane if there was no room. I currently have six points and if I was to take these I would be on 9; I dont want to be in this position. While I understand I was speeding, I had no choice to get back into my lane. Can I plead for a fine instead of the points? A: The court will say you shouldn’t have tried to overtake if it necessitated speeding. 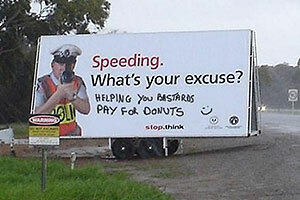 The police often teach people they can speed to overtake - that's bad advice. If you contest this and reject the fixed penalty ticket you could get another six points and a six-month ban, as the magistrates guidelines are less tolerant than the fixed penalty system; the guideline for that speed is 4-6 points. If you accept the speed alleged you are best off taking the ticket I'm afraid. 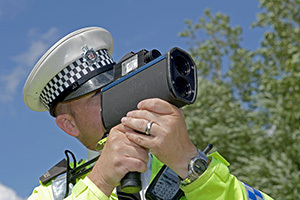 The problem that you face is that speeding is strict liability. So why you did it is irrelevant. The only defence is casting a doubt on the alleged speed. The only other option would be special reasons, such as doing it to get out of a risky situation. Special reasons is about not having any alternative. It’s likely that the magistrates would take the view that you had the choice not to overtake; this is what created the risky situation rather than something outside of your control.